Der PROFOLK e.V. hat von Mitte der 90er bis 2004 diverse CD-Sampler veröffentlicht. "Ist das schon so lange her, wirklich schon wieder ein Jahr. ", so beginnt ein Song von Reinhard Mey. Es sind in der Tat schon viele Jahre vergangen von der ersten "Deutschen Folk Förderpreis" CD bis zur "RUTH" 2006. Die produzierte CD der Baba Jam Band erschien unter dem Titel "Kayada" 1993 bei Acoustic Music Records. Produced by: Bernhard Hanneken for PROFOLK e.V. It´s only Kraut … but I like it - Explore real music from all over Germany ! Youre looking for a way to find out the latest in folk, song and world music in Germany, right? 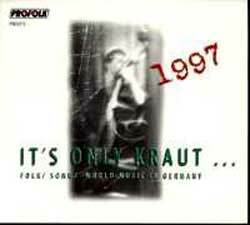 » Its Only Kraut...But I Like Its Folk, Song & World Music In Germany 97 «. Produced by: Ulrich Doberenz for PROFOLK .e.V. Prime Cuts - More real music from all over Germany! Where German folk music was once the victim of a national narrative it is now a national music experiencing a ´Blütezeit´- a heyday, a blossoming - . And it keeps getting better and better. That‘s how Ken Hunt recently put it in an article on the German scene for Sing Out! Magazine. The days are over when German bands would only take from other cultures rather than their own. The 1998 PROFOLK sampler CD Prime Cuts 1998 captures the bewildering diversity of this new music scene. There is plugged-in folk, well-crafted song portraits, there is an outstanding new finesse in instrumentals, there are many well known exponents of World Beat and still new grooves and talents emerging. Last year‘s sampler focused a lot on instrumental tunes as well as material sung in unaffected accents, abandoning the accepted pronunciations and the standard German. Do you remember Hundsbuam Miserablige‘s bombast, Jams‘ Low German hiphop and Saure Gummern‘s blues-tinged drolleries from Hesse? 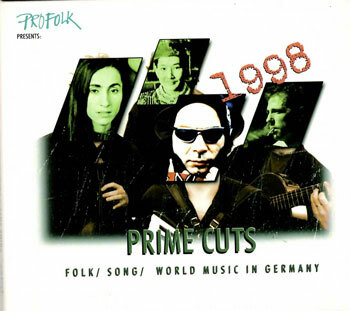 PROFOLK‘s 1998 collection features more world music than before, all Made in Germany. Who knows in which direction next year‘s sampler will go? To cite Ken Hunt again: A genuine renaissance in German folk music is taking place. And nobody has to take out German citizenship to witness its rebirth. This guy is right. Just put on this CD and listen. English translation by: Delf Maria Hohmann. Germany is not that big. But music-wise it offers the whole world within its borders. PROFOLK continues to bring you the diverse sounds of this country. 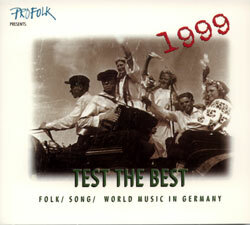 "Test The Best - Folk, Song & World Music in Germany 1999" is the third PROFOLK sampler following "It´s Only Kraut ... But I Like It" (1997) and "Prime Cuts" (1998). This year´s collection features once again the bewildering diversity of a new music scene, ranging from "brass klezmer", "punk´n´roll folk" and "blues from the German coal mining district" to "creative luting of European treasures of song", "folk rock à la Bartók", "Swabian dialect artistry" and "Alpine transglobal ethnojazz". The delegates of the 1998 Folk Alliance conference in Memphis, Tennessee, got a first hand look at this vibrant gumbo from Germany when PROFOLK presented an all German showcase night featuring Csókolom (Gypsy music from Transylvania), Holger Hoffmann (troubadour music), Hora Colora (jazz improvisation and Balkan music), JAMS (German polkas and quadrilles fused with rock, jazz, western and eastern roots music), Thomas Loefke (Germany´s leading exponent of the Celtic harp) and Wacholder (good ol´ Deutschfolk music). Folk Alliance board member Susan Martinez remembered her impressions in the Folk Alliance newsletter: "Chris Strachwitz got so excited about the group Csókolom in the German showcase that he rented the legendary Sun Studios and made a record of them on Saturday night!" Look for "May I Kiss Your Hand - Balkan Gypsy Fiddle Music" on Arhoolie records. Tower Records "Pulse!" magazine comments on Wacholder´s recent record "unterwegs" (On The Road): "The album confirms the trio´s vocalist Scarlett Seeboldt as the German folk scene´s most consistently seductive female voice, whether singing unison vocals with the other two members of the trio or solo on material ranging from German Romantic poet Heinrich Heine to Berlin dialect." So sit down and savour it ... "Test The Best"! 2003 wurde aus dem Deutschen Folk Förderpreis die RUTH. Rainer Prüß, Vorsitzender der Jury 2001, schrieb schon damals der Preisträger CD folgende Zeilen ins Booklet: „Zum zehnten Mal Deutscher Folkförderpreis. So eine bunte Mischung hatten wir selten. Multi-Kulti Mix, gute Instrumentalisten, gute Stimmen und engagierte Texte. Wie das in einen Topf passt? Immer weniger. Zehn Jahre Deutscher Folkförderpreis, zehn Jahre Diskussion um Äpfel und Birnen und endlich der neue Weg. Dieses ist die letzte Scheibe: Obstsalat. Der Deutsche Folkförderpreis wird zum Deutschen Folkpreis in differenzierter Spartenbildung. Das schien nötig und wir hoffen mit dieser Entscheidung dem Anliegen des Preises gedient zu haben." Die Zusammenarbeit der Auslober dauerte bis zum Jahre 2006, bis klar wurde, dass unterschiedliche Auffassungen über Förderung und Darstellung der Folk- und Weltmusik in Deutschland, in verschiedene Richtungen führten. Ab 2007 wurde RUTH von mdr Figaro und dem TFF.Rudolstadt ausgelobt.